The Wall Street Journal turned the tables on the presidents of 10 top colleges and universities with an unusual assignment: answer an essay question from their own school's application. 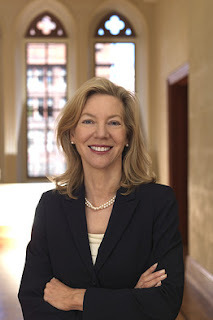 For Penn President Amy Gutmann, that meant submitting page 217 of her 300 page autobiography, where she discusses her professional accomplishments, including creating a vision for the school, dubbed "the Penn Compact," when she became the University's president in 2004. Thanks to Kiera Reilly (C'93, Director, Alumni Travel, Associate Director, Global Alumni Network) for the tip!